Experience the many healing benefits of acupuncture. Acupuncture can enhance your chiropractic treatment and accelerate the process of feeling better, or it can be a stand-alone treatment. When you come in for your appointment, Dr. Dane Becker can discuss all your options with you. Medical Style uses a dry needle and helps decrease pain and muscle spasms and increase circulation. 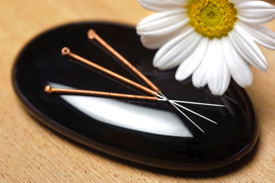 Acupuncture needles are only 1/20th the size of the smallest hypodermic needle and shouldn’t hurt or be uncomfortable. However, if you still don’t like the idea of a needle, we have a needleless option as well. Experience the many healing benefits of acupuncture. Contact our office today to schedule an appointment!